To be suitable for the installation of tiles in the thin-bed method with tile adhesive the substrate must be completely level and made of an appropriate, moisture resistant material. However, walls are frequently covered with a gypsum plaster coating as part of construction. 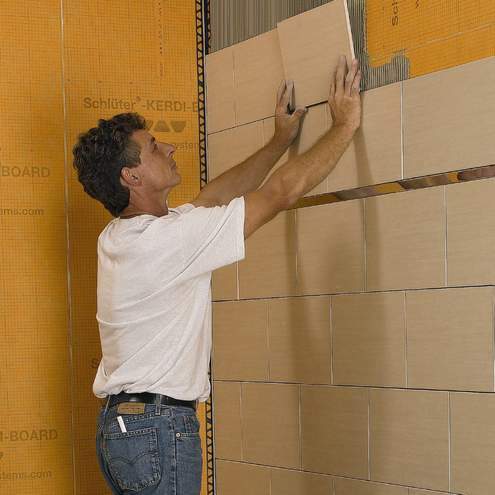 Plaster is not a suitable substrate for tile coverings, especially in high moisture areas. Additionally, these surfaces are typically not level enough. 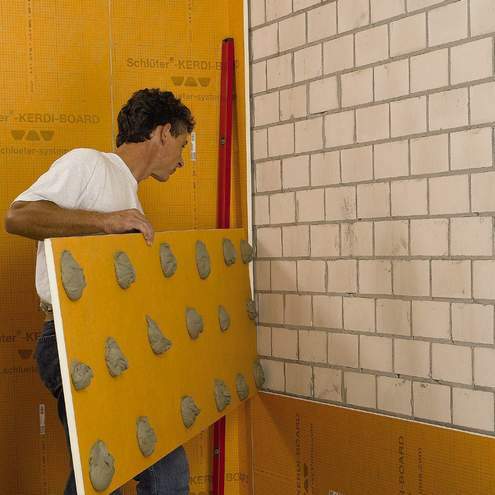 Other materials such as drywall panels or wood composite are equally unsatisfactory in these areas. 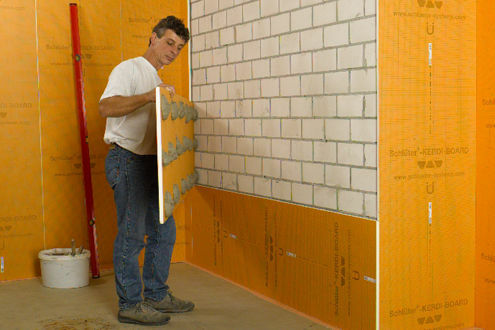 Depending on the characteristics of the existing wall areas Schlüter-KERDI-BOARD can be either fully embedded in mortar or attached to the substrate with dabs of thin-bed mortar or other suitable bonding mortars, followed by alignment and levelling. 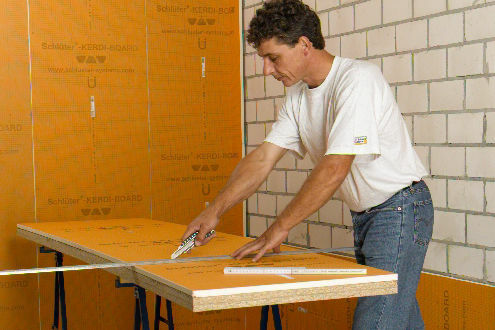 Schlüter-KERDI-BOARD can be installed vertically as well as horizontally. In the case of problematic substrates, Schlüter-KERDI-BOARD can also be attached with the help of the special anchors included in our hardware assortment. 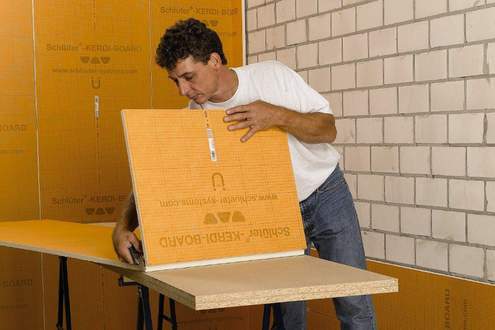 Substrates created with Schlüter-KERDI-BOARD are immediately ready for the installation of tiles without the need for further preparatory steps. 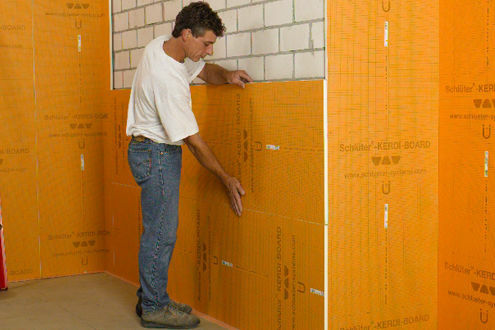 Schlüter-KERDI-BOARD is officially approved for use in bonded waterproofing assemblies. 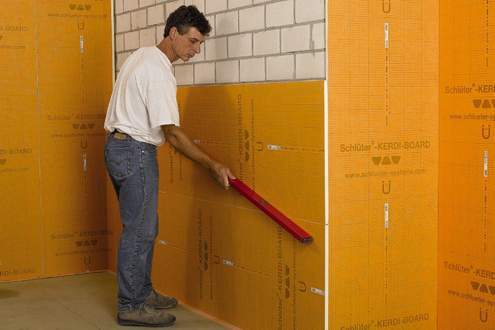 For this purpose, the corners and joints must be covered with the sealing tape Schlüter-KERDI-BAND, using the sealing adhesive Schlüter-KERDI-COLL-L. Pipe sleeves or similar features also have to be professionally sealed, e.g. with Schlüter-KERDI-KM pipe collars. If the substrate is sufficiently level to allow for fully embedding the panels in mortar, panel thicknesses from 5 mm can be selected. If using dabs of mortar to attach the panel, it is preferable to use thicknesses of 9 mm or more, depending on project requirements. 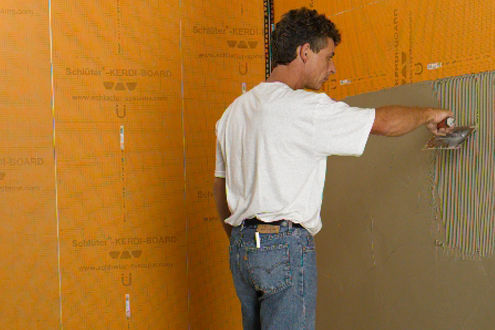 If partial areas will not be tiled, you can simply cover Schlüter-KERDI-BOARD with a spackling compound or plaster. 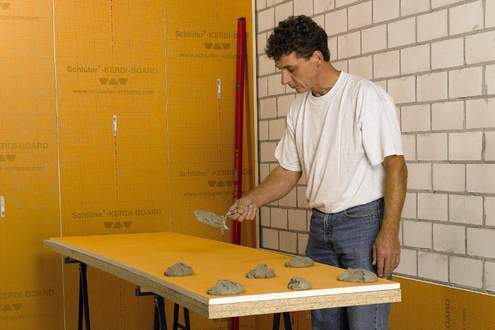 Abutting seams in the area, inside and outside corners, and exposed edges must be reinforced, for example with Schlüter-KERDI-BOARD-ZSA, and covered with a trowel-applied material. Video "Leveling board with spots of mortar"